French troops in Mali, on Thursday, killed about 30 Islamist insurgents during a gun battle near the border with Niger, France’s Barkhane mission said in a statement. According to Colonel Patrik Steiger, soldiers from Barkhane force and Malian troops were on a reconnaissance mission 90 km (56 miles) south of Menaka on Sunday when they encountered several dozen Islamist fighters, some on motorcycles. 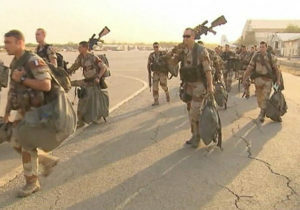 A number of Malian soldiers died in the ensuing gun battle, Steiger said. France has deployed around 4,000 French troops in West Africa’s Sahel region as part of Operation Barkhane aimed at tackling Islamist militants in the region. The region with its huge expanse of remote desert is home to several jihadist groups. Last month, two French soldiers were killed after their armored vehicle was hit by an explosive device near Mali’s border with Niger and Burkina Faso. Mali-based al Qaeda affiliate, Jama’a Nusrat ul-Islam wa al-Muslimin (JNIM) has claimed responsibility for the attack. In October, militants killed four US troops just over the border in Niger. JNIM, which has been responsible for other attacks, has also been linked to the kidnapping of at least six western hostages in the region. France’s military is also coordinating with West African forces, UN peacekeeping forces, and other allied military operations in the area. Posted by Geraldine Boechat on April 6, 2018. Filed under News. You can follow any responses to this entry through the RSS 2.0. Both comments and pings are currently closed.